The setting is “Bagel Beach,” so named because Jews were restricted from living in Connecticut’s other beach communities. Three sisters have spent all their summers there, first as children and now with their husbands and children. This beautiful, enveloping book paints a detailed and nuanced portrait of a most intriguing family. At the book’s center is the accidental death of child; in learning what led up to the tragedy and what followed it we become a part of the event and a part of the family. Everyone in the family – and every reader – will go on a journey that includes joy, grief, self-discovery, and, ultimately, wisdom. A multigenerational family saga about the long-lasting reverberations of one tragic summer by "a wonderful talent [who] should be read widely" (Edward P. Jones). In 1948, a small stretch of the Woodmont, Connecticut shoreline, affectionately named "Bagel Beach," has long been a summer destination for Jewish families. Here sisters Ada, Vivie, and Bec assemble at their beloved family cottage, with children in tow and weekend-only husbands who arrive each Friday in time for the Sabbath meal. During the weekdays, freedom reigns. Ada, the family beauty, relaxes and grows more playful, unimpeded by her rule-driven, religious husband. Vivie, once terribly wronged by her sister, is now the family diplomat and an increasingly inventive chef. Unmarried Bec finds herself forced to choose between the family-centric life she's always known and a passion-filled life with the married man with whom she's had a secret years-long affair. But when a terrible accident occurs on the sisters' watch, a summer of hope and self-discovery transforms into a lifetime of atonement and loss for members of this close-knit clan. Seen through the eyes of Molly, who was twelve years old when she witnessed the accident, this is the story of a tragedy and its aftermath, of expanding lives painfully collapsed. Can Molly, decades after the event, draw from her aunt Bec's hard-won wisdom and free herself from the burden that destroyed so many others? Elizabeth Poliner is a masterful storyteller, a brilliant observer of human nature, and in As Close to Us as Breathing she has created an unforgettable meditation on grief, guilt, and the boundaries of identity and love. Elizabeth Poliner is the author of Mutual Life & Casualty, a novel-in-stories, and the forthcoming collection of poems, What You Know in Your Hands. Her stories and poems have appeared in The Kenyon Review, Colorado Review, The Southern Review, Prairie Schooner, and many other journals. A recipient of seven individual artist grants from the D.C. Commission on the Arts and Humanities, she has also been awarded fiction scholarships to the Bread Loaf and Sewanee writers' conferences. She teaches creative writing at Hollins University. "If summer, for you, recalls days spent by the seashore, Poliner's saga of three Jewish sisters and the beachfront cottage they share with their families--until life-altering tragedy strikes--will enthrall you." "An instant classic.... Poliner handles the texture of Jewish family life with brilliance, authenticity, and a touch of wistfulness." 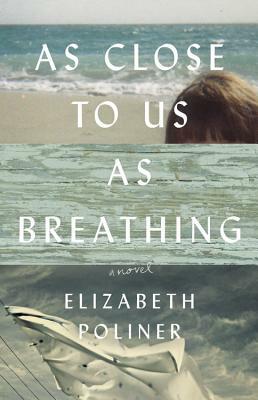 "Superb...As Close to Us as Breathing is a beautiful, complex, character-driven novel. In the author's capable hands, every one of Poliner's characters feels real. And, just as in reality, some of them succumb to life's challenging circumstances. And, just as in reality, some of them succumb to life's challenging circumstances. And some of them ultimately soar."